[Weekly News Bits] The One With G Z! Gastille is confirmed to be the mastermind manipulating Shiranui. AUTO (RC) GB1: [Counter Blast 1 & Choose 1 card from your hand, place it into the Damage Zone] When this Unit attacks, if this Unit is Boosted, you can pay the cost. If you pay it, choose 1 card from your Damage Zone, add it to your hand. 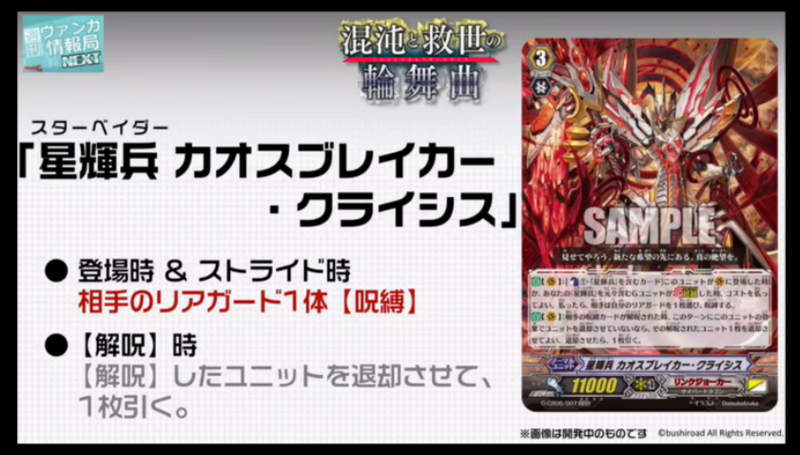 AUTO (RC) GB1: [Soul Blast 1 & Return this card to the hand] When your “Blue Wave” Vanguard Stands, you can pay the cost. If you pay, choose 1 of your “Blue Wave” Units, during that turn, it gains Power+4000. AUTO (RC) GB1: [Soul Blast 1] When this Unit attacks, you can pay the cost. If you pay it, for each of your other Units with the Bloom ability, during that battle, this Unit gains Power+2000. If you have 3 or more Rear-guards with the Bloom ability, Counter Charge 1. Vanguards VS The Dragon God of Destruction. The Story is headed to the Final Battle of “Z”. From the Planet Cray, Units dubbed the “Apostles” have descended upon Earth. “Dragon Deity of Destruction, Gyze” who will destroy all that exists. In order to bring about its revival, the Apostles, armed with the power of the 6 “Zeroth Dragons”, invade the Earth! Vanguard Fighters, stand together, to oppose them, fighting side by side, in order to break the chains of destiny and carve out a new future! The Ultimate God of Destruction who controls “nihility” who was wounded fighting against Messiah. It nearly brought Cray to the point of extinction in the past. Currently it’s apparently still sealed…!? During the U20, he traveled around the world, Calling the Diffriders who would become the Apostles. He waits to see how the U20 will turn out. Dumjid returns as one of the “Apostles”! The true face of this mercenary is revealed!? And he joins the ranks of *those* fighters. It appears she has some terrifying criminal scheme?! He’s not just brawns, but brains, and perverts the use of science. It seems he’s connected to a certain “Holy Sword”. He is the master of the prison of souls, “Relics”. He has a terrifying strategy to defeat his mortal enemy, Messiah!? The Forbidden G Units, “Zeroth Dragons” Descend! They’re the ultimate trump cards used by the “Apostles”! They apparently are the keys to completely resurrecting Gyze…!? 6 G Units that can be used with Nations, instead of just Clans! They can only descend upon the field during a Fight via “Ultimate Stride”! There’s unknown Star Gate, Dark Zone, United Sanctuary, and Zoo. GR’s inclusion rate is equal to the conventional rate of GR + SGR!! And, Z Rares are also included! Now, the highest rarity inclusion has been upped?! Z Rares are only for the Zeroth Dragons, and are super luxurious cards whose foil coloring depends on the nation. AUTO (RC) GB1: When this Unit Boosts, if your opponent has 2 or more Locked cards, during that battle, this Unit gains Power+4000, and when that battle ends, if the attack hit a Vanguard, choose 1 of your opponent’s Locked cards, that card cannot be Unlocked during your opponent’s next End Phase. AUTO (VC): [Counter Blast 1 “Star-vader” card] When this Unit is placed on (VC) OR When you Stride with a G Unit that has “Star-vader” in its original name, you can pay the cost. If you pay it, your opponent chooses 1 of their Rear-guards, and Locks it. AUTO (VC): When your opponent’s Locked card(s) Unlock, if you have not Retired a Unit with this Unit’s effect this turn, you can Retire 1 of the Unlocked Units, and draw 1 card.